Iain McGibbon proposed a public discussion to try to find out more about the life of the sitter in this fine pencil portrait by William Russell Flint. Ian provided the information that Commander B. Moore was an Engineer Officer responsible for X guns – in a ship, normally, A and B gun turrets are in the bows and X and Y turrets in the stern. He also added that the 1920 Navy List shows Moore as a Sub-Lieutenant with seniority of 1st October 1919, and the 1951 Navy List shows him as a Rear Admiral with seniority of 2nd April 1949. Art Detective Group Leader, Pieter van der Merwe, started the contributions by finding information from an obituary notice in The Times on 8th May 1985. This indicated that the commander’s full title was Rear Admiral Humfrey John Bradley Moore CBE RI, and that he died on 4th May 1985, aged 86. Pieter also found that he worked as an Engineer-Manager of Rosyth and Devonport Dockyards eventually retiring with the rank of Rear Admiral in the 1950s. Moore was also a member of the Royal Institute of Painters in Watercolours, meaning he was an artist too. Osmund Bullock found that he painted under the name ‘John Moore’. E. Jones found that Moore was born on 16th May 1898 in Knutsford, Cheshire and that he married Doris M. Best in Worcester in 1925 (announced in the supplement to the London Gazette, 7th June 1951). Bill Ellson was able to add that Moore was the son of bank manager, Harry Farr Bradley Moore (b.1862) and Mabel Clara Adelaide Cox (b.1867). Sadly, both of Moore’s parents had died by the time he was 14. Osmund Bullock built on this information, adding that Moore was educated at Rugby School (1911–1916) and the Royal Naval College, Keyham. The discussion provided significant details about the sitter’s life. The Russell-Cotes Art Gallery & Museum has updated its record accordingly and a more detailed painting description has been added to the painting record on Art UK. 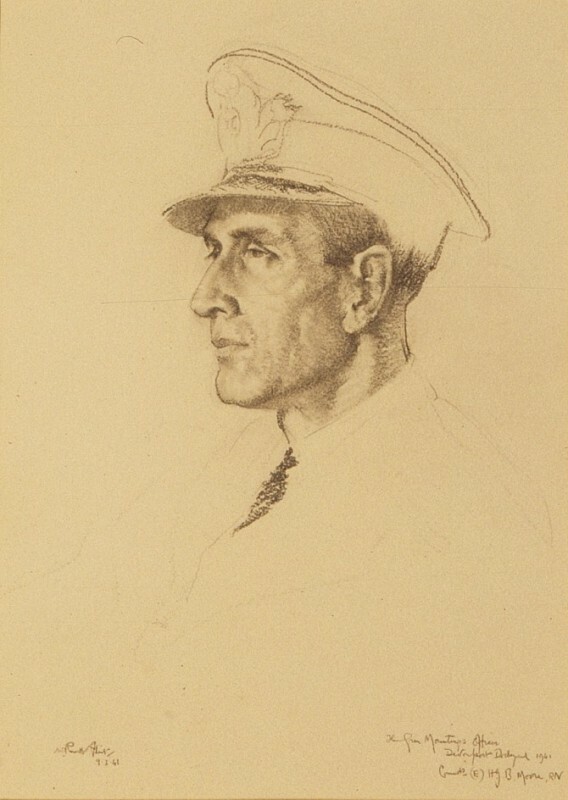 Can anything more be found about Commander B. Moore, drawn by William Russell Flint?